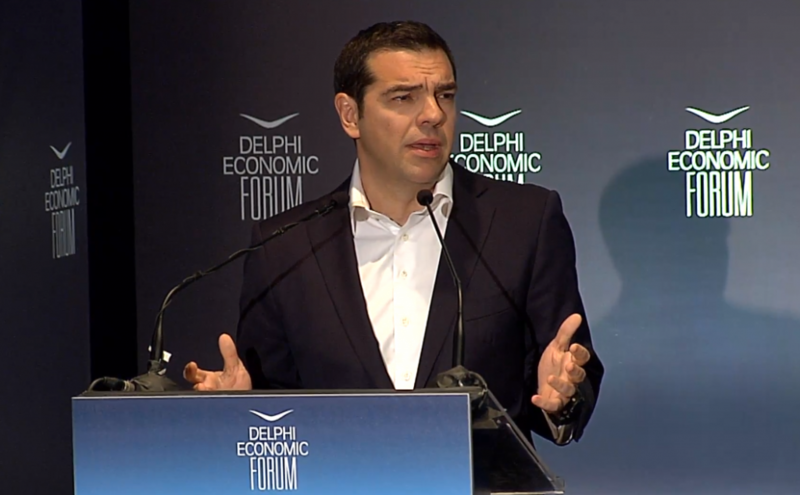 “Greece’s economy has returned to growth through difficult but necessary reforms,” said Greek Prime Minister Alexis Tsipras on Friday, during his speech at the Delphi Economic Forum III, which is currently underway in Delphi, Central Greece. “We are taking the final steps towards the end of the bailout program. A post-memorandum framework, which will define the relations with our partners or lenders is being prepared… The next day for Greece will be based now only on the successful implementation of reforms, but also on new measures that will lead to the country’s debt relief,” the premier added. According to Tspiras, the country’s growth rate has exceeded 2 percent, unemployment has been reduced by 7 percent, while Greece is maintaining a high primary surplus since 2016. “Following difficult but necessary reforms, Greece has become more friendly and reliable for entrepreneurship and investments, also reducing bureaucracy… Growth needs work, persistence, planning and dialogue with all interested parties to generate proposals, which would highlight every area’s competitive advantages,” Tsipras underlined. The Delphi Economic Forum opened its doors on March 1, and will run until March 4, in the town of Delphi in Fokida, a UNESCO World Heritage site. This year it hosts more than 400 speakers from Greece and abroad from the fields of politics, economy, business, diplomacy and academia, as well as think tank and media representatives.